I read the article which cited pros and cons about the ability for people of all ages to read and write cursive. 243 comments were posted on this subject with the majority for bring cursive back to the schools. Yes, we are in the age of technology where many preschoolers are aware of the basics of smartphones so by the time they hit kindergarten, they feel comfortable in front of a screen, albeit a touch screen, most likely. And yes, teachers have a busy day with all the added requirements to their daily planner. But let’s just take a few moments to ponder what your life would be like without writing a love letter or a thank you note on pretty stationary. Many, many people actually save handwritten cards and letters from their loved ones. Saving a note that was emailed to you is just not the same. 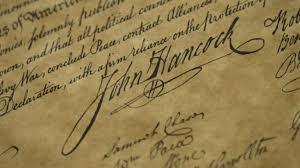 On a practical note, if people don’t know how to read cursive, how would they read the historical documents that is the basis for our government – The Constitution, the Declaration of Impendence, etc. Scientists are discovering that learning cursive is an important tool for cognitive development, particularly in training the brain to learn “functional specialization” — the capacity for optimal efficiency. 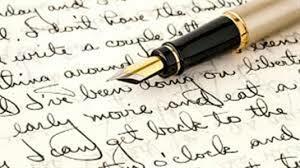 Writing cursive also develops hand-eye coordination, fine motor skills, memory and other brain activities. There is something creative and satisfying about good handwriting. In my opinion, cursive should be taught in schools and encouraged to be used frequently, and yes, that is my real signature below. Diana, Thank you for commenting. I am shocked that college kids can’t read cursive. They certainly are missing out on a lot, but it’s never too late to learn. Depends on where they went to school. Seems that many who were in metro PHX missed out on learning cursive writing/reading.